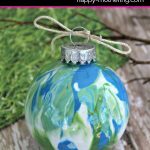 Homemade Christmas ornaments are so special for so many reasons. This easy Cinnamon Stick Christmas Tree Ornament makes a great gift. Not only is it pretty, it smells delicious! I love making Christmas ornaments. I fell in love with it in elementary school when one of my best friends and I would sit around and craft all through the holiday season. Her mom was so generous in letting us use her craft supplies. I’m not sure my love of crafting would be what it is if it weren’t for her. I like to look for ideas on ornaments to make in Christmas shops and craft fairs. A few years ago I saw an idea to make a Christmas tree ornament from a cinnamon stick and ribbon. I thought it was absolutely adorable, so I wanted to re-create it myself. This is a super simple craft that you can make in less than 15 minutes. It’s so simple, it could even be made at a school holiday party! You can vary the ribbon colors to match your Christmas decor. If you don’t have cinnamon sticks, even a nice stick from a beautiful tree would work! Tie lengths of ribbon along about 2/3 of the cinnamon stick’s length. Cut the ribbons into a triangle or tree shape. I use pinking shears because it helps keep the ribbon from fraying as much and I like a less clean shape. Once you’re happy with the shape of the tree, glue your tree topper on the top of the cinnamon stick. Glue a thin ribbon to the back of the cinnamon stick to use as a tree hanger. Hang your finished Cinnamon Stick Christmas tree on your own family’s Christmas tree! What color ribbon did you use on your Cinnamon Stick Christmas Tree Ornament? Awesome! I hope you have so much fun making your Christmas ornaments!